In a former life, Akiko was introduced to the team by her manager, “She can be direct, but I assure you that she will deliver what clients expect, and beyond.” Akiko has mastered the Japanese art of “Getting Things Done” with precision. Organisations and individuals alike value highly her expertise. 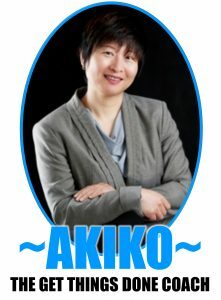 A qualified trainer and coach, Akiko helps her clients get things done and is always focused on delivering results. A master at harmonising chaos, Akiko coaches and trains in Japan, USA, and Australia empowering people in chaotic situations. She coaches individuals and teams through greenfield projects, significant organisational changes such as mergers and acquisitions, restructures including values and cultural changes. Akiko gracefully brings out the best in people by focusing on their strengths. She believes people only need to be reminded of how resourceful they are to achieve their full potential and to become who they wish to be. Most people underestimate their abilities and skills. Akiko’s vision: Choose and create the future you by taking that first step, the rest will come more easily. When things get chaotic, it is far more effective to work with someone who can chunk challenges down into manageable pieces. Akiko is an expert at getting everything done! Now she shares her skills that she learned in the corporate world with you. Contact Akiko with your challenge. She will work with you to sort it out and get things done. At the end of your coaching program with Akiko, you will be reminded of all you can do with some guidance. EDUCATION: NLP Master Practitioner, Master Ericksonian Hypnotherapist, Master Life Coach, Diploma of Life Coaching, Certificate IV in Training & Assessment, Bachelor of Business Studies (Major: Management & Human Resources Management). Would you like a free 30 minute chat with Akiko Kawakami? Click here or call her today on 0435 925 737 to discuss your Coaching needs and desired outcomes or email her with your phone number and she will call you.